“Look, ma, no hands.” That`s not what Capt. Mike Crawley said as we floated atop the placid water of Dana Point Harbor, but he could have. Crawley, a sales associate and Sea Ray specialist at Sun Country Marine`s Dana Point, Calif., office, was demonstrating one of the Sea Ray 470 Sundancer`s new features before we hit the open water. For a boat that looks fast, moves fast, slices through the waves easily and basically wants to be moving – the coffeepot in the cupboard was wearing a seatbelt in anticipation – it`s ironic that one of the 470`s most memorable features is Skyhook, which keeps the vessel in one place. A “virtual” anchor, Skyhook is part of the Zeus system that uses a combination of GPS and pod drives to keep the boat`s location fixed without deploying a physical anchor. 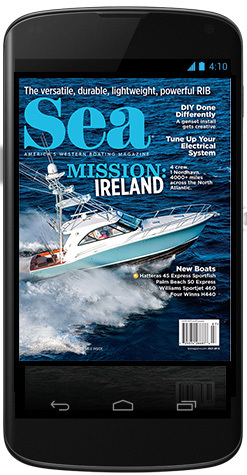 GPS determines the boat`s position and then directs the slowly spinning pod drives to turn in the appropriate direction to keep the boat exactly where it is. Approaching the 470 Sundancer at the dock, I didn`t think it looked long enough to be a 47-foot boat, even though it is. That`s probably what made the belowdecks accommodations seem so much larger than I expected. The space confirmed what I`d read, not what I thought I saw. 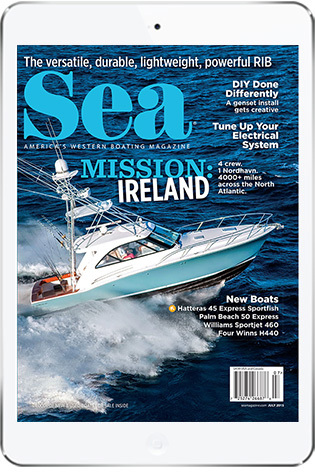 Sea Ray`s designers swept the lines of the hull and stainless steel handrail forward, with the rail mirroring the blue/white border on the hull, which starts near the waterline aft and comes to the top of the hull forward. The fiberglass hardtop, with its wraparound windshield and dual, independently retractable sunroofs, sweeps back at an angle opposite the hull and the handrail. The boat looks like the wind is blowing through its “hair” even when it`s at the dock. But the dock is not where the 470 belongs, and after Crawley finished the Skyhook demonstration, we hit the Pacific Ocean and its 2- to 3-foot chop. The boat handled the limited chop with relatively little effort, jumping off a few of the friskier waves with a controlled landing before charging ahead to the next one. We pulled a hard turn at near full throttle – in excess of 40 mph – and the boat didn`t shudder or pitch. During a mini-slalom run, the boat responded quickly and effortlessly to the wheel; it handles like a much smaller sportboat. You can change direction in an instant. The smooth ride, precise handling and improved fuel efficiency that excite Sea Ray and its dealers can be attributed to a couple things. The Zeus pods relieve the aft pitch of the vessel at speed, keeping it level and steady, ready for what the sea throws at it. The decreased pitch also contributes to a more efficient ride, which improves fuel efficiency. The 470 also utilizes auto-trim, which resets itself to maximize efficiency in any sea state. The nice thing about both of these features is that they don`t require any driver input. 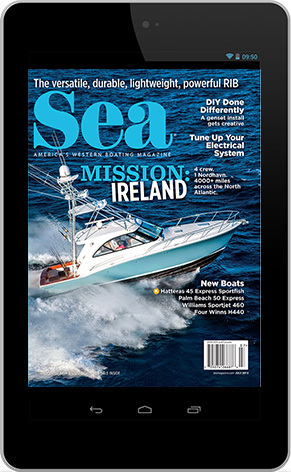 At about 3400 rpm and 37.5 mph, a speed that was easy to maintain and didn`t stress the boat, the twin Cummins MerCruiser QSB 480 diesels were burning a combined 50 gph out of the 350-gallon capacity. At 2700 rpm, we were traveling at 31 mph and burning 36 gph. Cruising along at 15 mph, the rpm count dropped to 2250 and we were burning 25 gph. If you boat with children, there`s more to interest them than just the video-game-like Zeus joystick on the 470 Sundancer. For one, as mentioned before, it`s got plenty of speed and can carve through the waves. Another feature kids will like is the swim platform, which is huge, especially for a boat this size. It has a concealed four-step ladder and enough room for kayaks or inflatable water toys. Belowdecks in the salon, children will enjoy the entertainment center, which includes a gaming port (to keep the mini-dockers` fingers and wrists well-practiced), an iPod interface with a docking station (Sea Ray will not mediate the dispute over whose music gets played), a Sony stereo and a 26-inch LCD TV with DVD that drops down out of the ceiling. It`s not magic, but it`s sure to impress many a viewer. There`s even an option to add a 19-inch HD TV mounted to the wall at the foot of the twin beds in the second stateroom – which includes its own head and shower. Adults will like the belowdecks accommodations, too. Down a set of four teak steps is a wood-and-vinyl sanctuary. In one large, open space, the salon is to starboard and the galley is to port. A couple of oversized hull windows and 10 portlights make the space bright, and the dark cherry cabinets shine. The salon features an L-shaped settee with seating for five or six and a high-gloss wood table. The aforementioned ceiling-hidden TV is opposite the settee, in the forward corner of the galley. In the galley, the cream-colored countertop and the stainless top-and-bottom refrigerator/ freezer unit contrast nicely with the dark wood cabinets and teak floor. A microwave/convection oven, trash receptacle, above and below storage, a two-burner recessed stove with a black glass top and the seat-belted coffeemaker round out the galley`s accoutrements. Forward is the master stateroom, with a queen-size island berth that has two drawers underneath. To port is a private head – tile flooring, VacuFlush toilet, vanity with storage below, mirrored medicine cabinet – and to starboard is the master shower with a seat and an adjustable wand. There are two hanging lockers and two gunwale storage cabinets, one of each to port and starboard. A 19-inch LCD TV with DVD player drops from the ceiling for your viewing pleasure. Up in the cockpit, there`s room to seat 10 comfortably on a double-seat captain`s bench, a port-side lounger and a U-shaped settee to starboard, half of which is under the hardtop. The aft portion of the U-shaped settee opens like a set of French doors and joins with the large pad behind it to create a sunning area, just out of the reach of the hardtop. There`s another sunpad for two on the forward deck, accessible via port and starboard sidedecks. The control station is a gelcoated dash with twin Raymarine displays (optional), a backlit switch panel, electronic engine controls, the Zeus joystick control and a SmartCraft VesselView display (SmartCraft runs diagnostics every half second). Options for the dash include a fishfinder module, a depth display, a Sirius weather module and a larger primary display. A wet bar with a sink, an ice-maker and a faucet sits to port of the U-shaped settee. Our test boat has the optional electric barbecue grill. 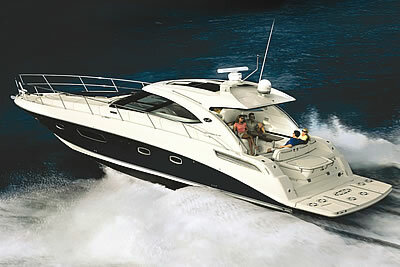 All in all, Sea Ray has built a versatile sport yacht that serves several ends. As a day-tripper, the 470 Sundancer can comfortably accommodate 10 people – a dozen if everyone really likes one another – and provide outdoor environments that are both open air and covered, and a relaxing indoor space if anyone needs to recharge. As a weekend vessel, the 470 can keep six people comfortable – the salon sofa has cushions that convert it to a sleeper. The second head really makes the boat versatile enough to house the extra people. If a couple wants to take a longer cruise, the 470 can serve in that capacity, too. They might even be able to bring their two kids along – at which point the comfort would be provided by the boat, but the civility is up to the humans. At least the coffeepot will be safe.